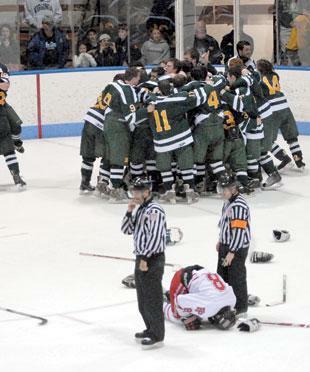 Congratulations to the entire Hamden High School Boys Hockey program on repeating as Division I State Champions on Satuday (20-March). The Dragons earned back to back titles by defeating Fairfild Prep 6-5 at Yale's Ingalls rink. Refer to the links listed below for local coverage on the game! 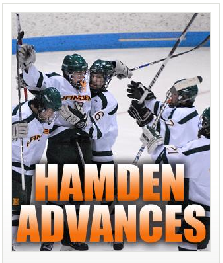 The Hamden High School Boys hockey team earned the right to return to the CIAC Division I Finals by beating Dairen 3-2 last night. The final, against Fairfiled Prep, is to be played tomorrow (Saturday, Mar 20) at Yale's Ingalls Rink at 2pm. For those of you not playing in your own tournaments this weekend why not come out to cheer on the boys while they take a run at repeating as State Champions. Most of these players skated their entire time in youth hockey with HYHA. Tickets will be sold at the door.